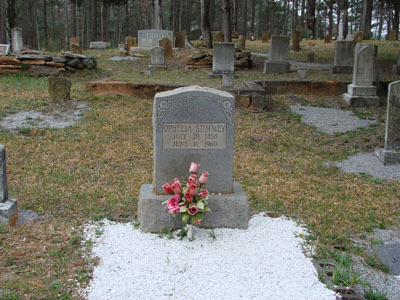 Ophelia Summey, daughter of Lintford Samuel Summey and Artilda "Tilda" Anne Tidwell, wife of Benjamin Frank Dorsey. Tombstone is incorrect. Birth year should be 1878. Mrs. Ophelia Summey, age 81 of Route 3 Cartersville passed away Saturday morning at a local hospital after a lingering illness. She was the daughter of the late Lintford and Matilda Tidwell Summey. Survivors include a daughter, Mrs. Luther Lee, two brothers; Kay Summey and Dock Summey of Cartersville, seven grandchildren and 17 great grandchildren and several nieces and nephews. Funeral services were conducted Monday afternoon at Macedonia Baptist church located on the Canton Road. The Rev. Willie Howell and the Rev Francis Summey officiated. Interment was in the church cemetery with Owen Funeral Home in charge of the arrangements. 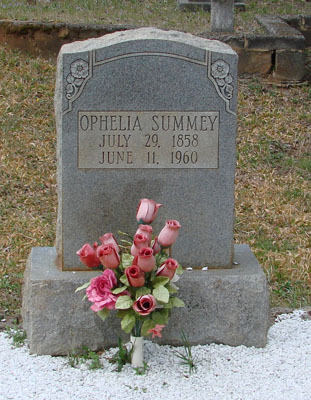 NOTES: At one time, she was married to Benjamin F. Dorsey, but she is buried under the name Ophelia Summey.